A small mod that allows your character to join the Legion. Note: This mod is essentially dead until further notice, I've played new vegas to death and moved on to other games. 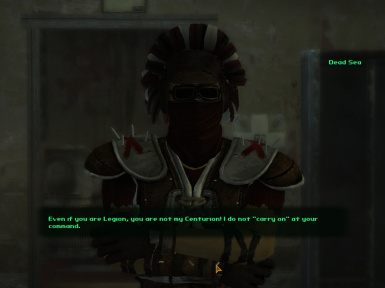 My only goal currently is get past the current bug preventing progress in the main quest, in the update I'm about to release, I've cut Caesars dialogue so hopefully that helps. 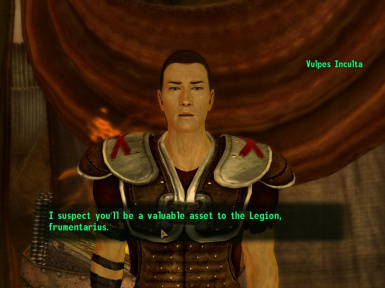 So you've done many quests for Caesar and you want to join the Legion? Then this mod is for you! I found it quite strange you could join most of the small factions but not the NCR and Legion, so I decided to make it. What this does is it's primarily just changes some dialogue options to help immersion, there are no quests as of yet but it's still a heavy WIP. I promise more to come. I'd try and get the perk as soon as possible or you will miss a lot of the dialogue. Currently Not compatible with the Vulpes companion mod, I'm currently working on a fix, The trait version will be somewhat unaffected but you may miss a line or two of vulpes edited dialogue.